Ant-Man shrinks down to uncover Manhattan’s most well-hidden secrets. Archangel comes to the rescue when Magneto attacks the X-Mansion. Will Doctor Octopus make a sucker out of Captain America with his mechanical tentacles? High above New York City, S.H.I.E.L.D. prepares to deploy. As Stark Tower gets torn to pieces, Mister Fantastic stretches onto the scene. Anyone can skydive off the Helicarrier, but only Mister Fantastic can become his own parachute. Spider-Man drops by to showcase his amazing web-slinging skills. The heroes’ pursuit of the Cosmic Bricks leads them to Asgard, home of Thor. Ready for battle, the Avengers assemble at Stark Tower. Iron Man uses his repulsors to watch over New York from above. 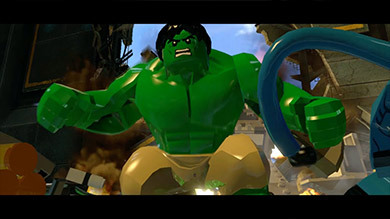 Hulk faces off with Abomination in a battle of the Big Figs. As Magneto schemes, Loki and Doctor Doom show off their powers. To use one of the above desktops on your Mac or Linux PC, click on the image you'd like and select the resolution that most closely matches your screen. This will open the image in a new tab or window. Right click on the image and select "Use Image as Desktop Picture" (the wording may vary depending on which browser you're using).